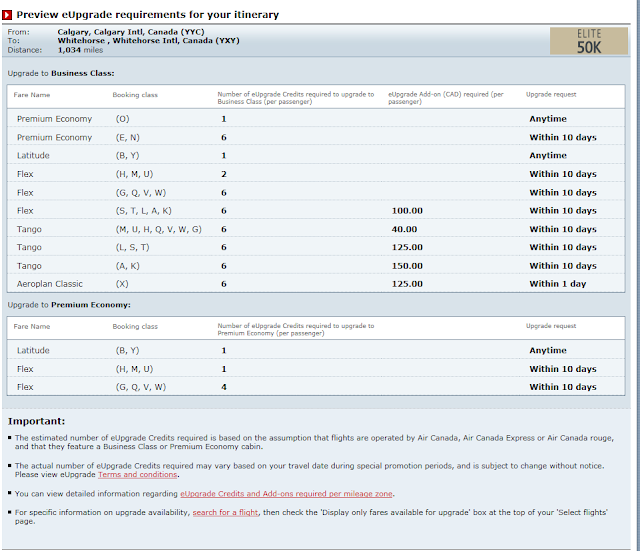 Rewards Canada: Air Canada Altitude eUpgrade process made much more difficult? With Air Canada’s recent switch to offering “More Economy Flex Fare Options”, it has become much less clear whether your booked flight qualifies for an upgrade. The older method was pretty simple: If you booked Flex, you were eligible for an upgrade, if you booked Tango, you were not. (Though they have recently allowed certain Tango fares to be upgraded with an additional fee). Now it is virtually impossible to see if your fare is eligible for upgrade without an additional fee as they have incorporated the Tango fare class (S,T,L,A,K) into the Flex category. In fact, according to the chart below, all of the Fare classes are now shown in both Flex and Tango. How is it that certain Tango fares have less of an add-on fee than a Flex fare? And why should a Flex fare have an add-on fee at all? Air Canada has stated that there are now “New lower Economy Flex fares” available for booking. But the add-on fee for that is $100.00. The majority of the flying public do not have any status and will pay the price that is listed. Are we to believe that Air Canada lowered the cost of a Flex flight by $100.00, the price that 95% of passengers booking will pay, in order to put an add-on to persons attempting to upgrade? I think not. When booking online, you are clearly shown the fare type, but not the fare class. So you really don’t know if you will be requested to pay an additional fee for upgrading until you actually try to upgrade after you have made your purchase. I am travelling to Whitehorse (YXY) on Wednesday and booked through the company travel agent. I specifically requested Flex fare and asked them to clarify the fare class for me. I was told that my bookings were in the “W” and “G” class. Both of those fare classes allow for eUpgrade without additional charge. That seems to correspond to the first letter of the “Fare Basis” below. However, when I access my eUpgrade account, it shows me that “The purchased fare class for this flight does not allow for upgrades”. This flight is less than 48 hours away, so I am well within my booking window of 10 days for Elite50. 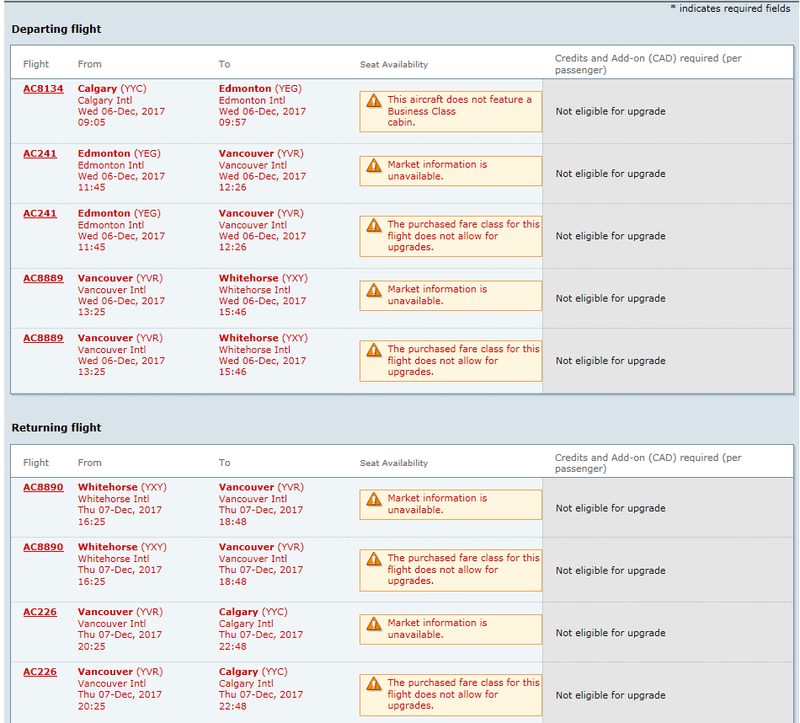 I also don’t see how my itinerary is “Not eligible for upgrade” when each and every Fare class on the chart above says you can upgrade (unless they have fare classes that are not listed, which I highly doubt). 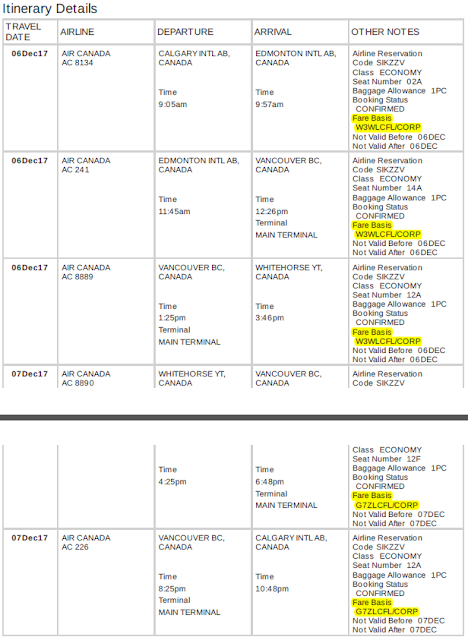 Air Canada has made a simple and easy to understand process into a convoluted and difficult booking procedure. It is probably a safe bet that a lot of people who purchased a Flex fare thought they would be able to utilize their eUpgrade to Business Class as usual, only to find out they now had to pay an additional fee. And how many of those people paid that fee, which has resulted in additional income for Air Canada.